With RedMonocle, you'll know exactly what your tools cost and how well they're meeting your needs. Make the right decisions at the right time about strategic IT investments, identify opportunities for improvement, and prepare for digital transformation. 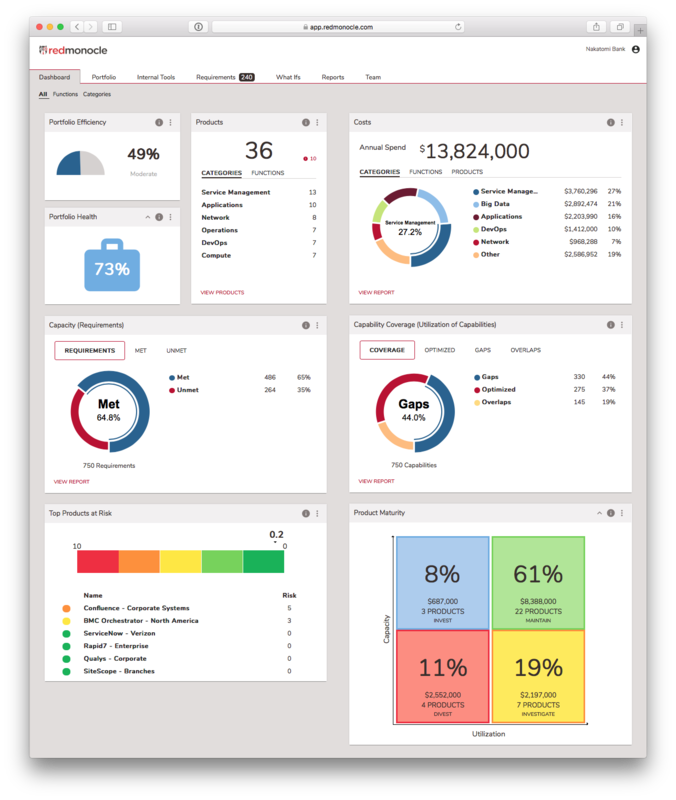 Gain a real-time, 360º view into your investments in IT tools and the business value they deliver. Quickly spot security holes and critical vulnerabilities in deployed tools. Maximize return on your portfolio of IT management tools without heavy investment of time, talent, treasure. Where is your money going? Are you spending it wisely? 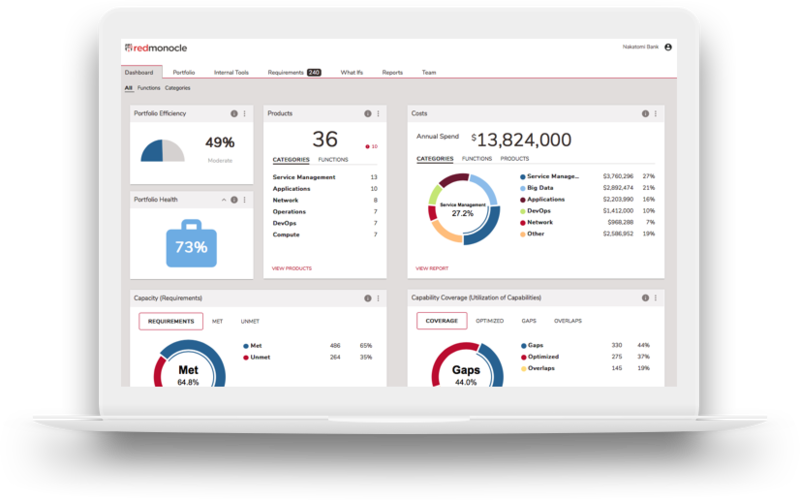 RedMonocle helps you win the battle against IT tool sprawl with a powerful technology portfolio management solution that gives you immediate insights into what you’re paying for and whether it’s meeting your current and emerging needs. Evaluate current tools and your readiness to manage emerging technologies. Prepare to execute digital transformation strategies like cloud...big data...DevOps...AI...and more. See costs for your current infrastructure and operations portfolio (by functional areas) and capabilities of your deployed tools. Assess how well IT tools are meeting your needs and how effectively they're being used. Quickly identify tools that can be optimized, replaced, eliminated, or consolidated to reduce costs. Divest overlaps, fill gaps, identify underutilized tools and address unmet needs. Compare current scenario with future options and to see opportunities. Create what-if scenarios to demonstrate the impact of bringing new products into the portfolio. Gain full access to the RedMonocle Knowledge Base to manage your infrastructure, operations, and security tools requirements, as well as to mitigate the risks of non-current versions. Conduct IT portfolio reviews on a quarterly, semi-annual, or annual basis to ensure your data is current. Leverage automated workflows and reminders to keep your portfolio knowledge base up to date. 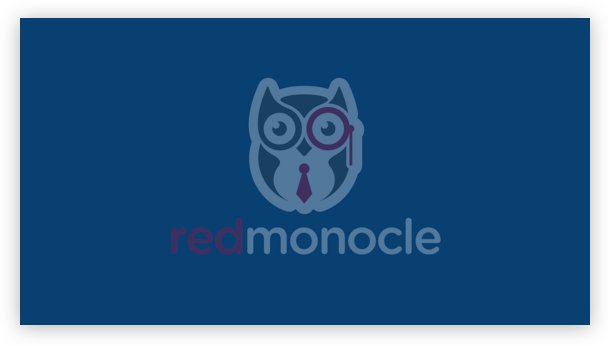 See RedMonocle in action and learn how to win the battle against IT tool sprawl! © 2019 RedMonocle, LLC. All Rights Reserved.